Image caption Shinzo Abe called the snap election in September, and said the results were a "vote of confidence"
Japanese Prime Minister Shinzo Abe has promised strong "counter-measures" against North Korea, after winning a decisive victory in Sunday's election. Mr Abe had called an early election for a greater mandate to deal with "crises", including the growing threat from Pyongyang, which has fired missiles over Japan in recent months. His ruling coalition has retained a two-thirds majority in parliament. Speaking at a press conference in Tokyo, Mr Abe said his coalition's win was a "vote of confidence" from the public, and based on that "we would dramatically show counter-measures against the North Korea threat". He said he would discuss these measures with US President Donald Trump, who is visiting Japan next month, as well as with other world powers such as Russia and China. He said they would exert "stronger pressure" on North Korea, adding: "I will make sure the Japanese public is safe, and safeguard our nation." Mr Abe saw his popularity plummet in recent months while embroiled in political scandals, but enjoyed a sudden recovery after North Korea fired two missiles over the Japanese island of Hokkaido. The BBC's Rupert Wingfield-Hayes in Tokyo says Mr Abe's pledge of tough diplomacy with North Korea is rhetoric that would play well with the Japanese public, but it is unclear what it means in concrete terms. Tokyo has no diplomatic or economic relations with North Korea, and has poor relations with Pyongyang's closest ally China, so the most Mr Abe can do is strengthen Japan's defences and stick closely to the US, our correspondent adds. Mr Abe's ruling Liberal Democratic Party (LDP) coalition with the Komeito party has won 313 of the 465 seats in the lower house of Japan's parliamentary Diet - which gives them the power to table a revision to the constitution. He had set a deadline of 2020 to achieve this highly contentious task. But on Monday he appeared to ditch this target, saying it was "not set in a concrete schedule". He said he hoped to "form a strong agreement" on the issue among parties in parliament, and "gain trust" from the Japanese public. Our correspondent says Mr Abe's victory is also in large part due to the chaos of Japan's opposition parties. Mr Abe's election win also raises his chances of securing a third three-year-term as leader of the LDP when the party votes next September. 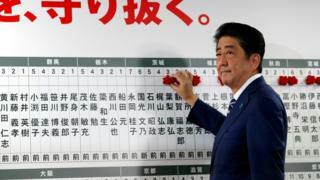 Japan elections: Will Abenomics help Shinzo Abe win?